Whether you're an experienced beard enthusiast or just starting out on your beard journey the Golden Beard New Growth & Conditioning Oil for men is specially designed for use on all types of beard and moustache hair, a tonic for hair growth. 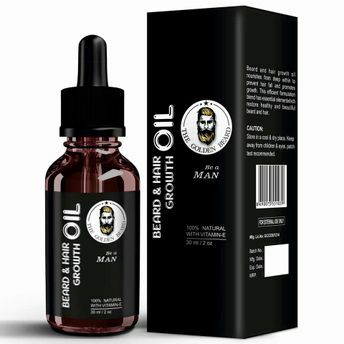 This beard hair and beard growth oil is a blend of finest natural ingredients specially designed to promote beard growth, fix patchy beard, and conditioning & softening your skin and treat hair follicles. It is an intensive treatment to deeply soften and tame your hair. This premium beard and moustache oil takes your beard to the next level, unequally formulated and blended to perfection. Apply a small amount to beard and then rub into the facial hair evenly and you will be left with a luxurious shine and feel. About the Brand: The Golden Beard Company is all about bringing the two best things in the world Great Beard and Bearded Men. The Golden Beard Company's exclusive recipes boasts of 100% natural oils? trusted ingredients revered since antiquity for their healthful and beautifying properties that do not contain any harmful chemicals giving you the most groomed beard of all time.